We’ve all been there. You’re running late, you’re just about to dash out the door, but you need that perfect necklace to complete your look. What should be a seemingly easy task quickly descends into chaos as you try on a multitude of dazzling options, none of which seem to be a perfect partnership. Thankfully, I’m here to make this common scenario a thing of the past, with my 7 style savvy secrets to perfectly pair your necklace with the correct neckline. A scoop neckline is one of the most flattering, carefully working to elongate the neck and draw the eye down. And because this neckline affords plenty of room, when it comes to adding a necklace, go long or short, statement or subtle. My guidance is usually to focus on the style of the top. If it boasts a print, choose an understated piece, or if it offers a plain backdrop, choose a bolder piece to take center stage. One of the most common necklines (especially in the world of weddings), the sweetheart neckline works particularly well for ladies with broader shoulders and a straight waist. The open neckline creates the illusion of curves around the neck, so that the eye focuses on the center of your figure. This neckline calls for a shorter, statement necklace, such as a large pendant, or, due to the openness of the neckline, a delicate drop won’t be missed. A high neckline, such as a polo neck will bring the eye out to your shoulders, helping narrow faced and small chested ladies appear more proportioned. 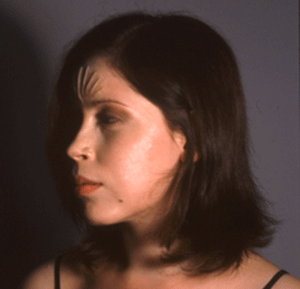 The high neckline can be tricky to navigate. With so much going on at the top, sometimes it’s good to draw attention downwards, by choosing a pendant on a longer length chain. Again, this one is a little tricky, but we’ve got the perfect solution. Shirts and blouses offer the option to be open or closed so if you would prefer to wear jewellery, my advice is to open a few buttons and create a V-neckline. This palette now offers the perfect backdrop for your necklace. Choose a shorter length chain with subtle pendant or drop so as to not overwhelm your look. When it comes to the V-neckline, a higher option is perfect for smaller chested ladies, while a deeper V-neck will elongate, lengthen and slim the chest for those with a larger bust. When choosing your necklace, the ‘less is more’ motto comes into play. A smaller drop pendant which comes into a point, and perfectly matches the shape of your neckline has a visually pleasing effect. This subtle and sophisticated look packs a real fashionable punch, yet oozes true elegance. The collarbone and décolletage region is one of the most flattering, yet overlooked areas of the body and a square neckline really highlights this. 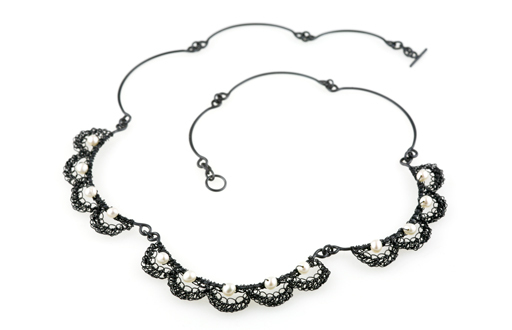 This style quite literally creates the perfect backdrop for your necklace. Choose something which fills the space, such as a shorter, wider pendant, for maximum effect. The perfect option for pear shaped beauties, the boat neckline offers balance. It is marked by a horizontal line, which carefully follows the collarbone, helping to enhance narrow shoulders by widening them out. This neckline offers coverage so choose a long pendant to add length and depth. This also helps to break up the look by creating a focal point. Now that you know your necklines, when it comes to adding your necklace, if it doesn’t feel right or make sense, it probably isn’t right. Selecting the perfect necklace for the job can not only make you look great, but feel it too. Happy accessorising. With the Fringe gradually coming to an end it was the perfect time to engross myself into the world of “Dazzle” – the place to be if you are a new jewellery designer/maker like me. 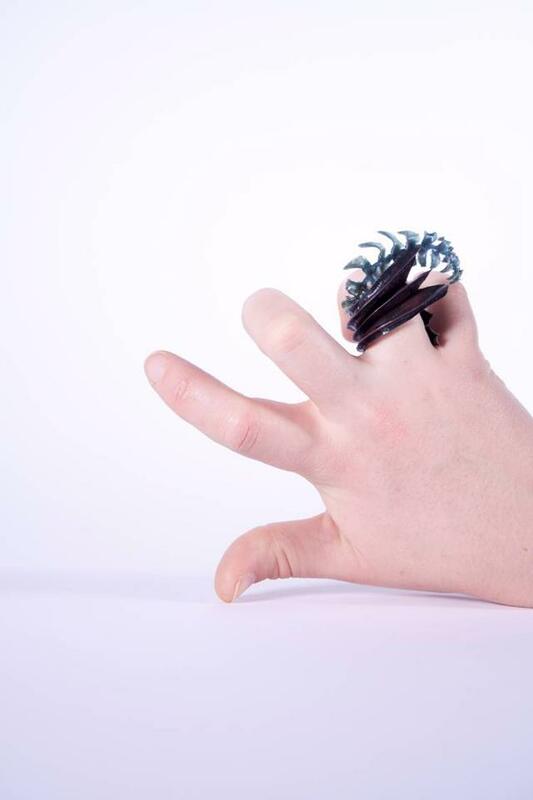 Dazzle showcases the best of contemporary jewellery by new graduates, as well as internationally renowned designers. The reason for my visit was to observe current jewellery trends and check out unusual techniques as I too, am beginning a business in jewellery. To start off, I was welcomed by the colourful abstract work of Heather McDermott, a young contemporary jeweller based on the Isle of Skye. 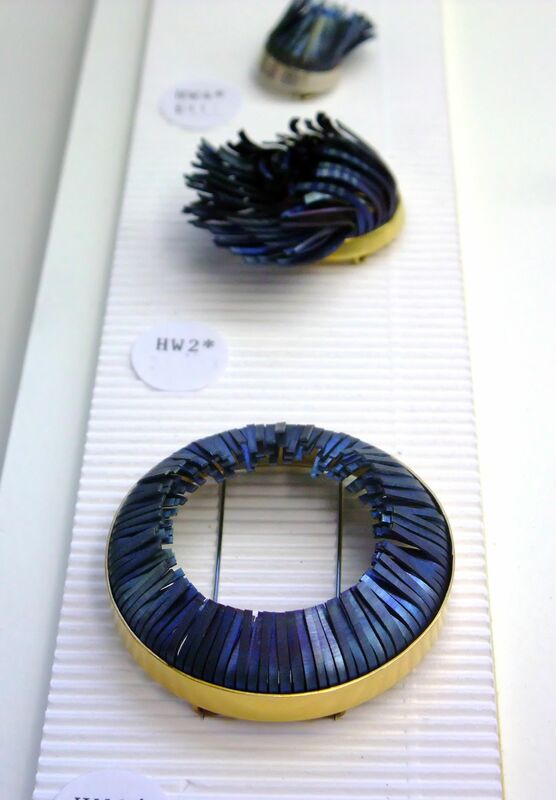 Her jewellery is inspired by discarded objects and windswept grasses on Scottish seashores. 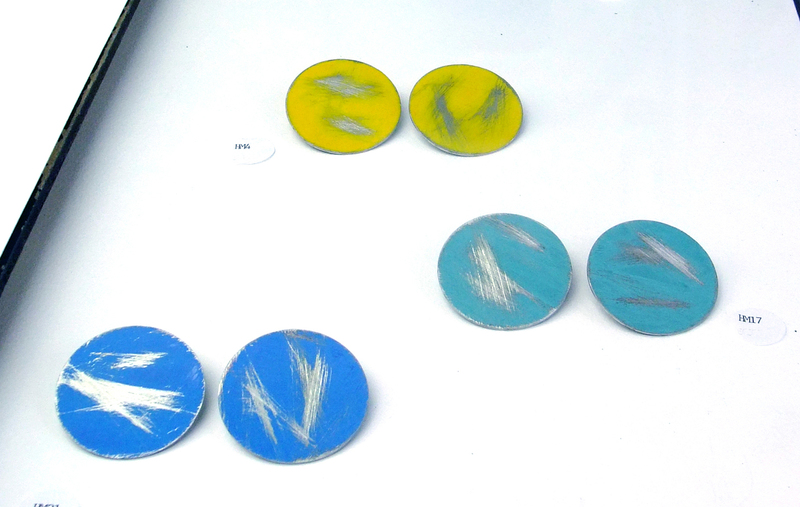 Heather predominantly works in stainless steel and coats her jewellery with a special vibrant paint, which she then scratches off, to create the illusion of being weathered, just as you would see on a tidal landscape. I find her use of colour really effective in catching attention of the viewer, something to note if you want to lure customers to your work. Next, I came upon Beth Legg‘s work and it was such a pleasure to look at. For me, granulation is a lovely technique which instantly makes a piece look more intricate. 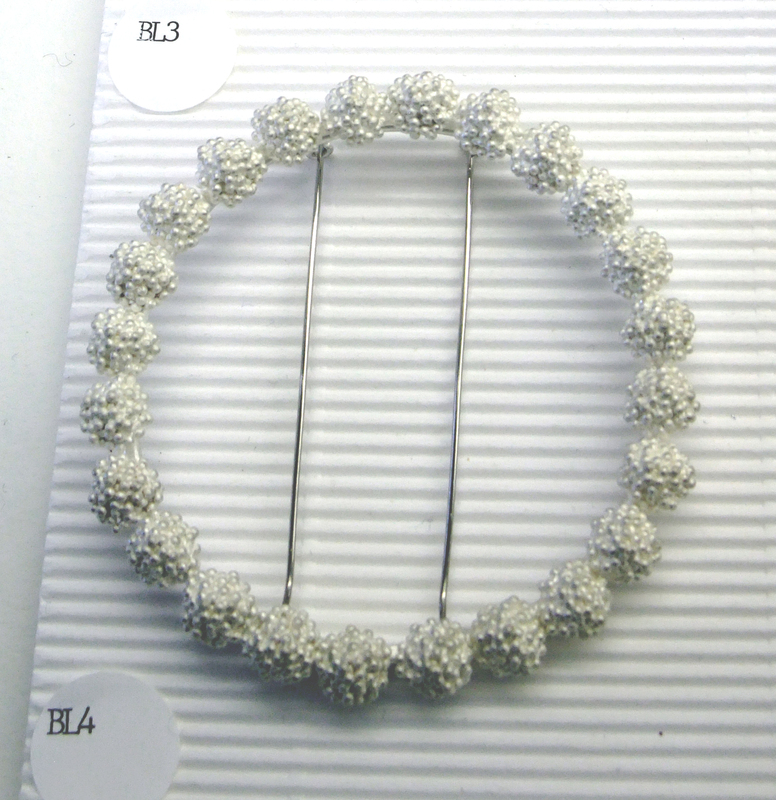 It is the creation of tiny silver balls which are then soldered onto your design, or in this case, soldered together! Legg’s pieces are inspired by the fragile nature of Scottish coastal landscapes. 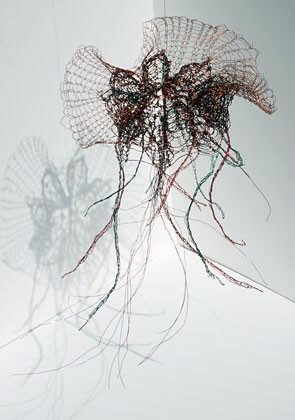 All her pieces are beautifully made individual sculptures, emphasising her sensitive and detailed approach to working. 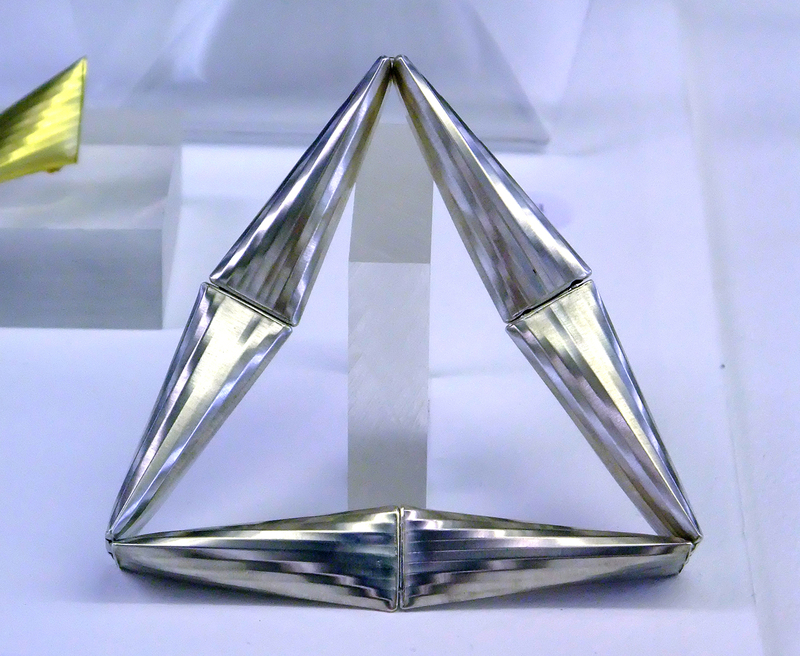 Another jeweller’s work that caught my eye was Katie Roberts. I instantly recognised her work from stumbling upon it on Pinterest! The work is stunning in person, with the light reflecting off the three-dimensional forms. 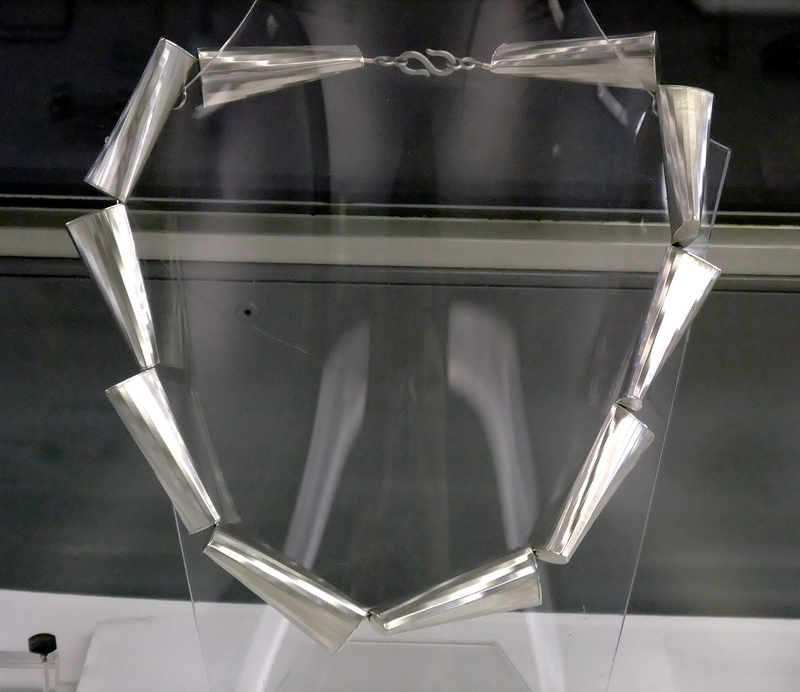 Roberts has developed an innovative technique, allowing her to create unusual embossed-like lines on the inside of her creations – creating an amazing rippling effect on the metal. Similar to when you see light reflecting off the water’s surface. 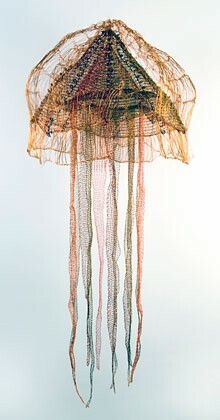 I have always been a fan of Jenny Llewellyn‘s work because of her love for sea life. Llewellyn is a contemporary jeweller and creates playful silicone jewellery inspired by luminous colours, shapes and movements found underwater. The pieces really do look like little creatures that could live on rocks and corals! I love how she has successfully combined this gelatinous soft material with precious metals, not usually found in jewellery. I see she always tries to find ways of fixing the silicone forms without the use of glue, this shows her skill and eye for detail in jewellery and makes the pieces high-end. Llewellyn has recently been nominated as one of the “Professional Jeweller Hot 100 2014”, showcasing “innovation, business development and design skills over the past 12 months”, definitely something to be proud of. 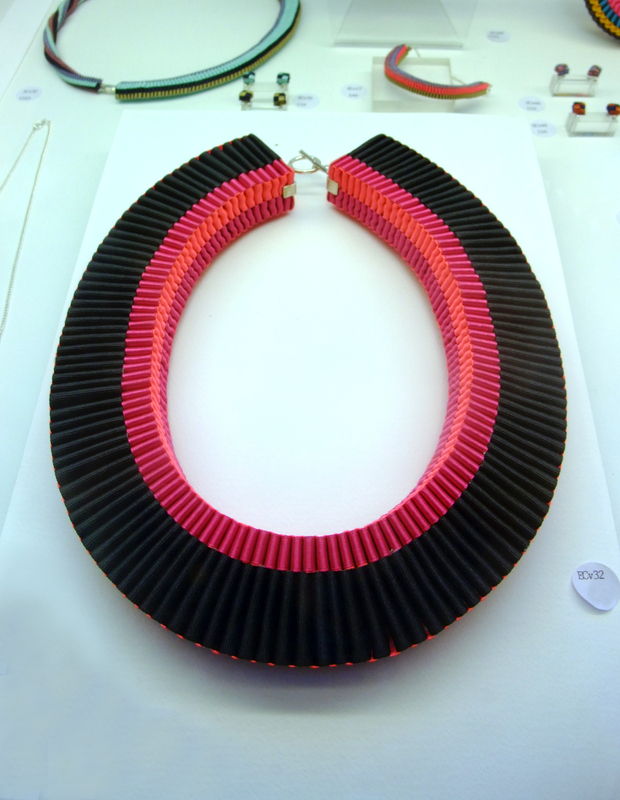 Emma Calvert creates statement textile jewellery, combining traditional weaving techniques with contemporary colours and precious metals. Interesting enough, she graduated in BA Textile Design from Central St Martins. Just shows you how diverse jewellery can be. 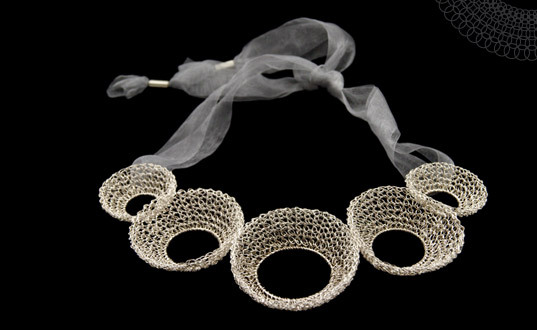 Calvert likes experimenting with woven textiles, transforming a two-dimensional material into a three-dimensional form, which she then translates into jewellery. I have to say, I did purchase a wee present for myself here. Lastly, I have to mention Heather Woof‘s work. The pieces really evoke a sense of movement. Woof is based in Edinburgh and is inspired by wild Scottish weather – and I think we all know what she means here. 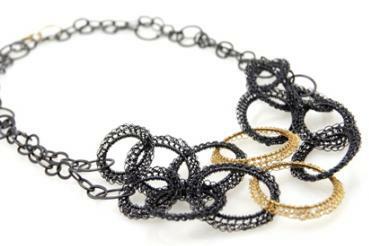 She works in hand-cut titanium, steel and precious metals, resulting in elegant wearable sculptures. The colours are beautiful, there is not only blues in the work but greens and purples melded together to enhance a sense of fluidity. I think the colours replicate that of Scotland’s stormy skies and rough seas. It is amazing how she has shaped this hard rigid material into something that looks so elegant and flowing. Overall, I found Dazzle to be an inspiring event to visit, especially for a new jeweller like me. From what I have observed, I feel that the contemporary trend is growing here in Scotland due to the colours and push for mixed media materials and design. It is great to see that craft in Scotland is flourishing, seems that it is the place to be for a craftsperson. I believe it is important to visit and take part in such events – to observe any changing trends and stay within the loop of Scotland’s Craft community which is growing stronger everyday. Well after graduating in June 2013 with great results, I immediately got emailing to apply for experience within the ‘real world’. For sometime I had been inspired by Haute Couture/Fashion Designer, Iris Van Herpen, with her innovative catwalk garments and futuristic designs. So I plucked up the courage to email her. To my surprise I got a positive reply and was asked to start as soon as possible in her atelier in Amsterdam. Amazing! My first day at the studio was an extremely nerve-wrecking one, with other makers and sewers, busy, getting on with serious work. The studio was situated right next to the harbour, with a view of house boats and a great big river. I was met by Iris’s assistant who carried out a small interview and explained what I was to do within the studio. The first job, I remember, was to thread gold chain in and out holes on the sleeves of a black dress. A repetitive but quite theraputic job. Everything, I soon realised, was hand done. The amount of patience and self-motivation needed in this kind of job was essential. Months quickly passed and I soon learned how to laser-cut, as I believed this could benefit my jewellery. First we cut tiny pieces of plexi-glass, a special hard plastic, which were to be hand-sewn onto dresses. Black patent leather was cut shortly after, which we used for strap dresses, beautifully cut into intricate strips to form the pattern for a short dress. It was truly amazing. These dresses became part of the “Embossed Sounds” Collection, where garments created sounds when pressed. My computer skills on Illustrator quickly improved after drawing detailed Spec sheets and laser files. These had to be perfect. Everything had to be perfect. If not, you were told to do it again. Strap and Plexi-Glass Dresses in “Embossed Sounds” Womanswear collection. We even learned how to make the outer layer of stiletto heels. Winding snake chain round heels, shaping carbon and using black pony hair was all needed to create these shows. Cut, shaving and glueing, sanding, brushing, winding. These were some one-off heels alright. Hours of precise cutting to get the most accurate horse hair fit. 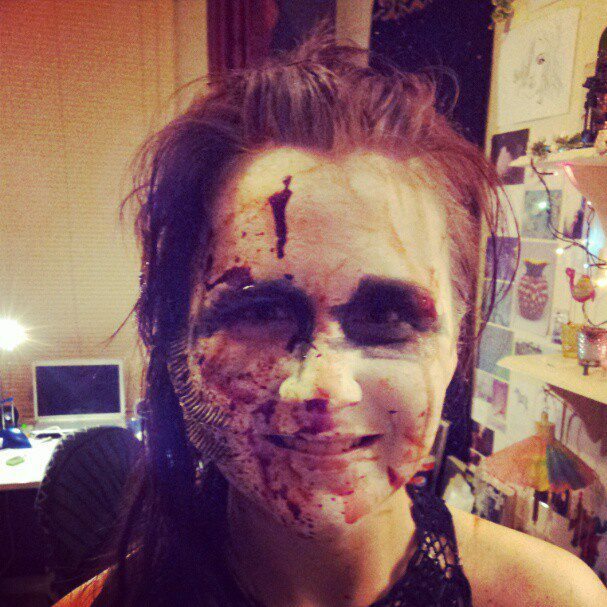 However, the final result was stunning. 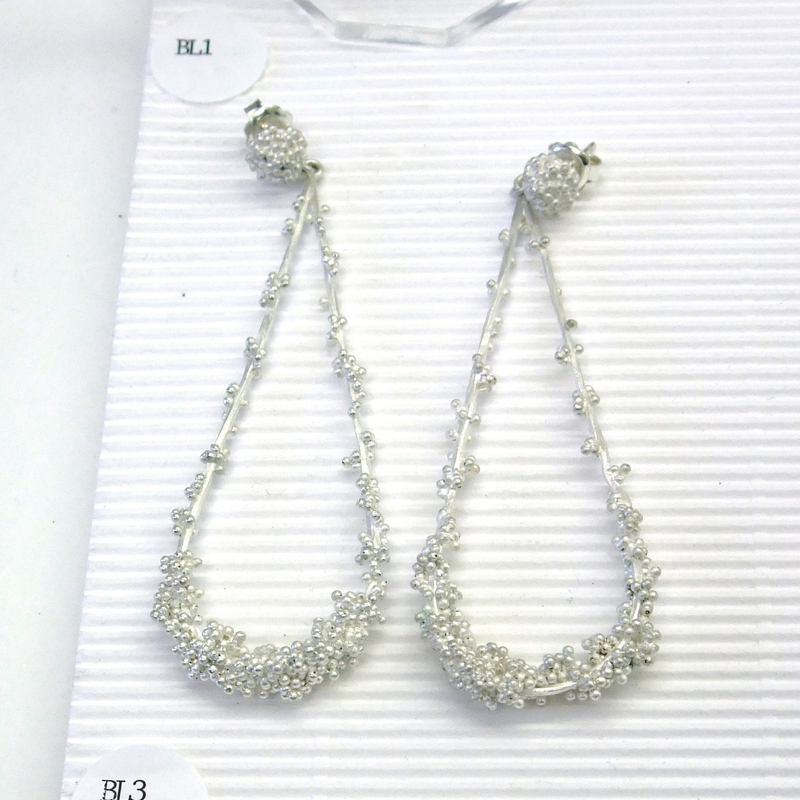 Elegant and stylish and perfect for any fashion diva looking to ‘wow’ at a special event. But these heels must’ve been over 6 inches high! Hats off to whoever can walk in them. After becoming a master of the laser-cutter, Iris handed me the job of replicating her famous ‘Water Dress’. 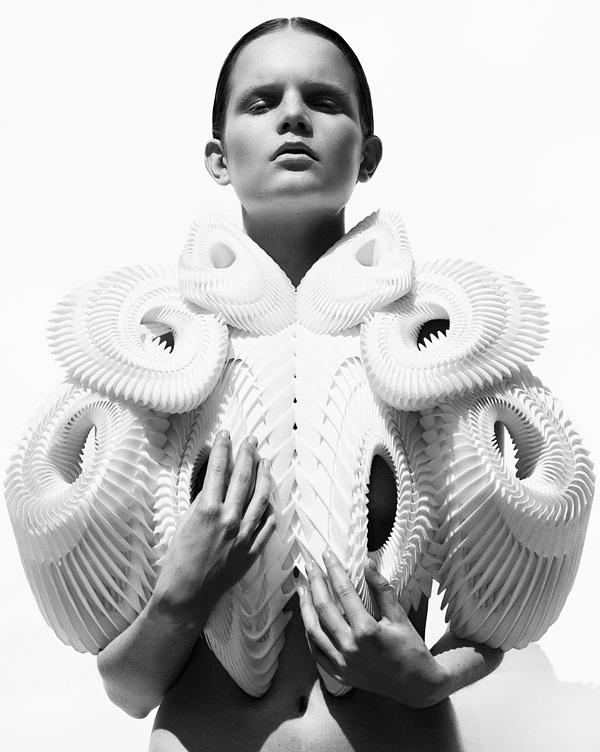 A large wearable sculpture made from special plastic, formed into curling waves and splashes around the wearer. Iris is a polite but driven young woman. I felt honoured to be given such a job and listened to all her guidence carefully. Using gloves and tools, I began to heat up the plastic and stretch and bend it to form these amazing shapes. It was a kind of meditation. After hours of working it began to take its form and look fluid like water. I tended to make the edges of the plastic bubble so that it would look like the sea foam found on waves. Heat formed Water Dress found on Iris Van Herpen’s Website, part of Crystallization collection. At the end of the day, Iris approached me and was complimentary of my pieces, saying she was nervous to give somebody this job but that I had achieved the look she wanted perfectly. She was very happy so I was happy. I reckon the best thing about working at Iris was experiencing what it is like to work in the high-fashion industry. You do not realise how many hours and dedication is needed for this kind of job. Also, most importantly, the people you meet. We became a family and helped one another through the highs and the lows. I met individuals from all over the world: Romania, Hong Kong, Australia, Morrocco, Poland, Germany, and so on. 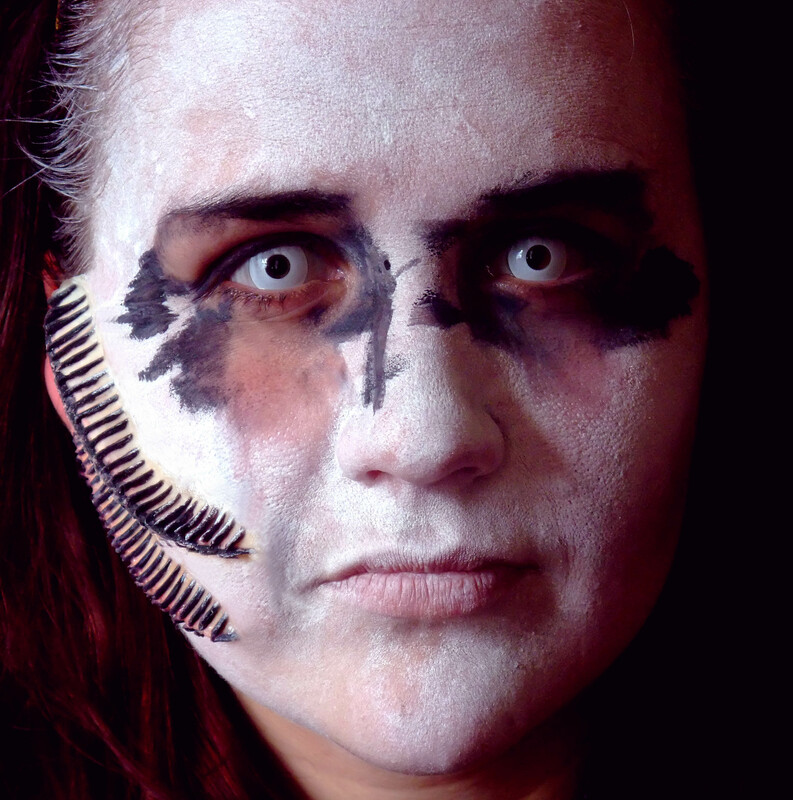 These contacts are invaluable and will stay with me forever. Lorenzo Nanni studied textiles at Duperré Art School in Paris. 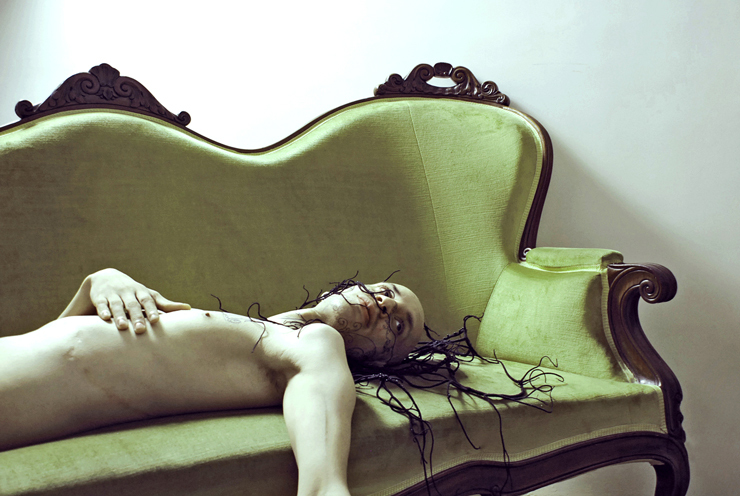 He is influenced by organic and living organisms, pulsating slightly eerie matter re-born and replicated in embroideries and silk. Nanni uses these materials in a very unusual way; using embroideries to imitate the texture of blood and producing fake skin out of silk. Reproducing the essence and beauty of nature is his goal. 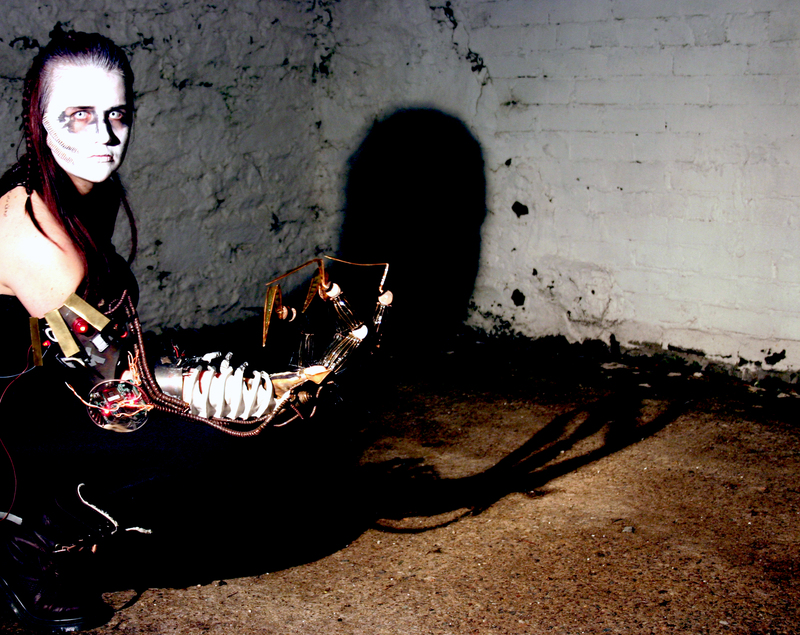 His prosthetic pieces come encased in a glass dome so they can also be exhibited as an elaborate sculpture as well as worn to the human body. The pieces may take many forms, mostly all coming from natural resources, using animal life and vegetation, body tissue, veins and arteries, to produce stunning yet at times dark and cheerless pieces. I really like Nanni’s works because they are unique and creative. 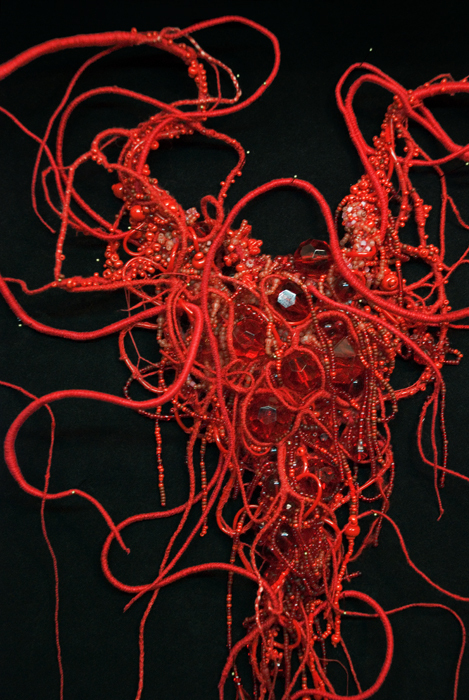 His use of embroideries and silk are particularly imaginative; establishing interesting textures. I enjoy the contrast of beautiful versus sinister themes, you feel a sense of uneasiness which lures the viewer in and makes the pieces memorable. I am not sure if I would want to wear these pieces out, however, as an elaborate sculpture in the room would be ideal. 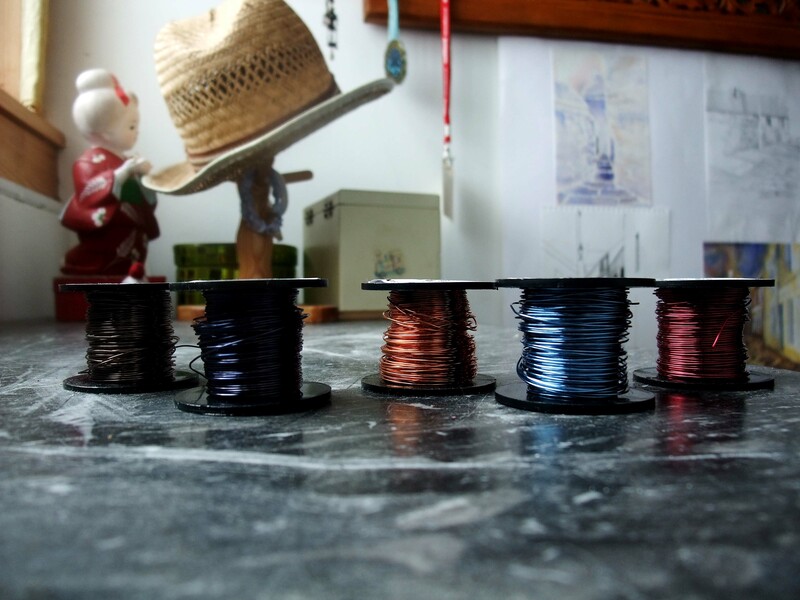 I have been having a good go at weaving wire this summer and have even ordered a wee batch of coloured wire for myself! Brilliant start. 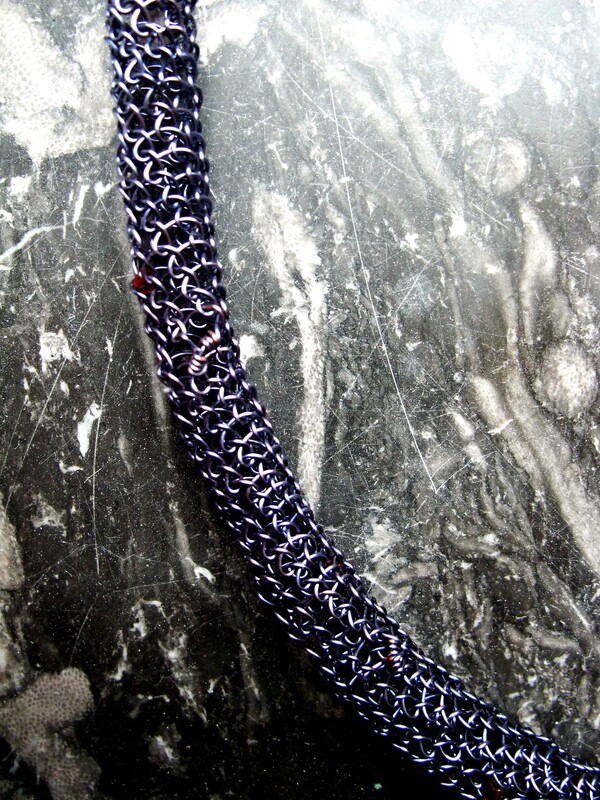 What I have just finished is a purple necklace which I had weaved round and round a paint brush. Yes you can weave around anything these days. The close-up detailing of the loops I think are pretty fancy. 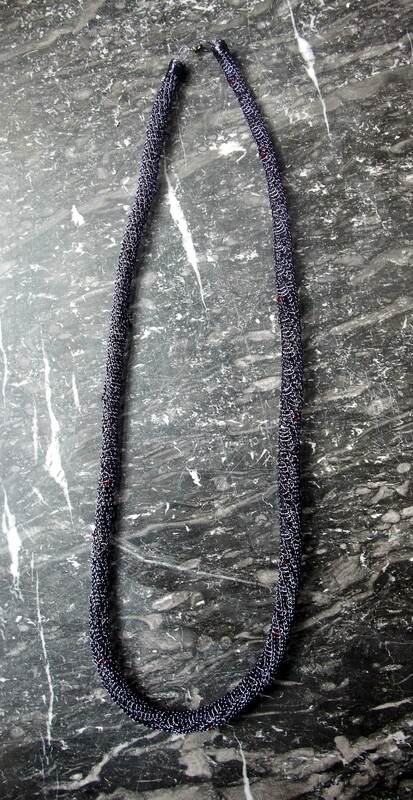 The necklace consists of a continuous looping technique which can be worked without needles. 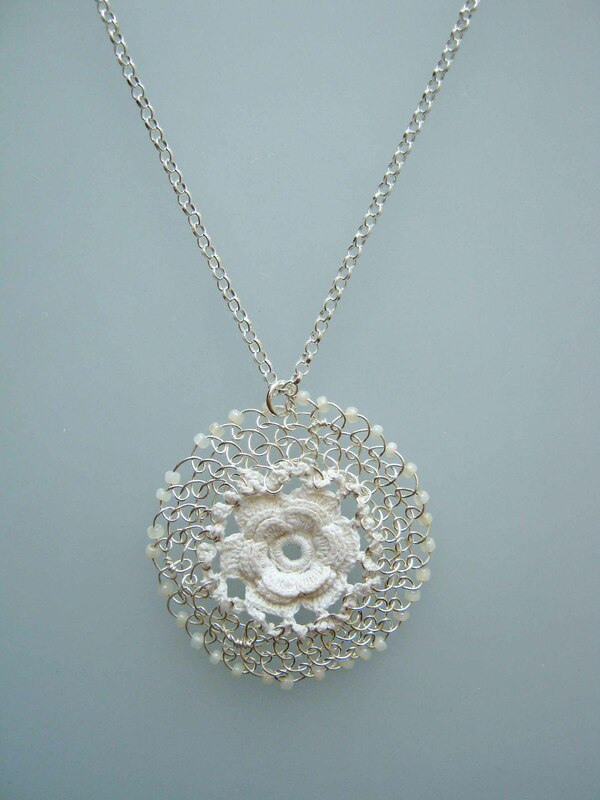 I have added small red bead embellishments to create more visual interest and intricacy. 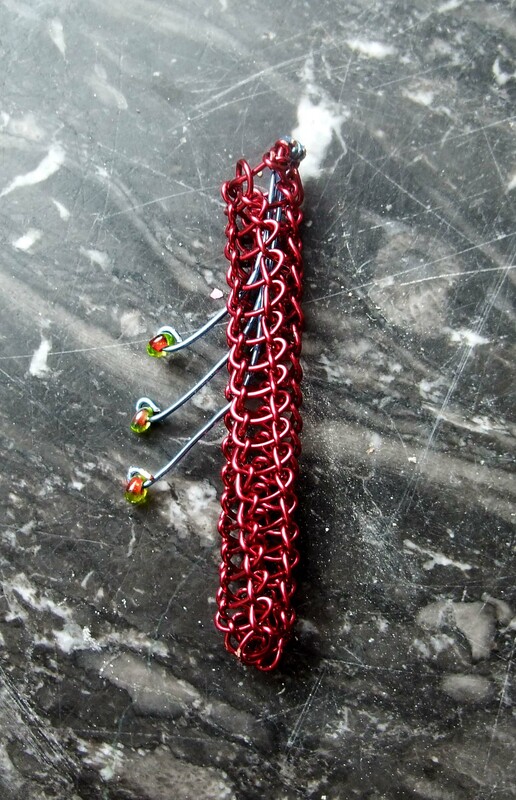 Here’s another sample I have worked on which I am hoping to turn into some earrings. Wire can be worked in so many different ways as I have discovered from looking at so many different designers. For instance Teri Howes uses a very similar technique to what I have just used. 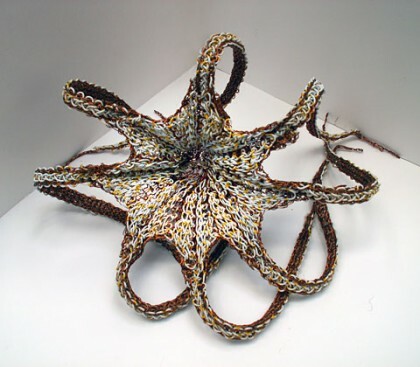 Processes Howes use include wire crochet, wire knitting with two needles, and wire knitting on a spool. Howes’s inspiration comes from textiles, pattern, geometry, architectural and sculptural forms. Her designs are so intricate and delicate in appearance which I particularly like. Very feminine. 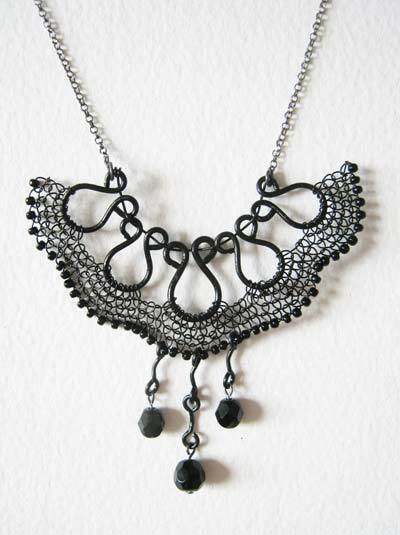 The jewellery looks reminiscent to that of the Victorian period: full of lace-like pattern. It is as if Howes draws with the wire. I like the way in which Howes does not use machine when creating these delicate pieces. A quiet rebellion against the mass-produced products we buy these days. 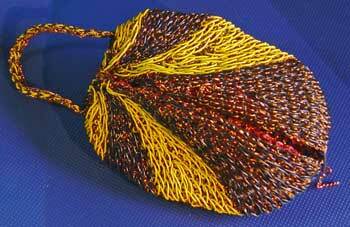 Judith Brown is quite similar to Teri Howes in the way in which she also weaves and hand stitches in wire. 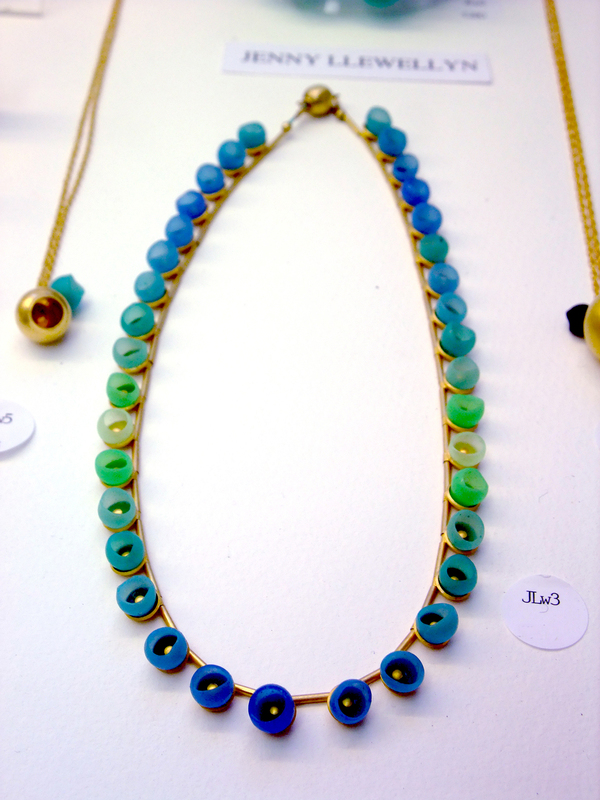 She is a British Designer Maker and her jewellery possesses a delicate feminine note. Brown learnt how to sew and knit from an early age with her mum and thus, textiles has played a big part in her work. This piece comes from Brown’s Vintage Lace Collection. 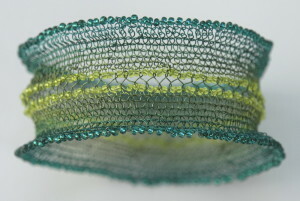 This dramatic bracelet is a combination of knitting and twisting techniques and is made of fine copper wire embellished with tiny glass beads. 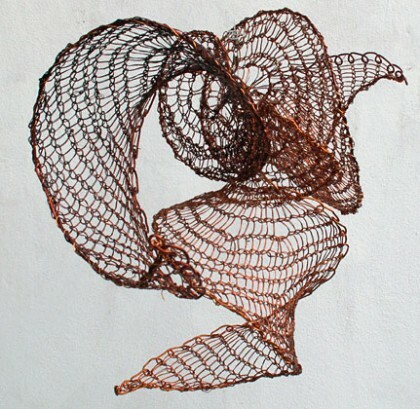 Another designer who excells in using wire is Welsh wire sculptor John Bivel-Fauvel. Bivet-Fauvel is inspired by cultures from history (old and new) and nature, both from land and sea. Instead of just copying , he attempts to capture the quality and essence of nature. All his works are made from found and inessential materials: “the wire I use comes from inside slot machines, electric motors, transformers and any other sources I can find”, thus, all his pieces consist of recycled materials which I really like. His technique is knitting, initially using a knitting machine. However, for more difficult forms he rapidly began to construct his own frames, made all from reclaimed materials of course, to create his sea creatures. The range of work by Binet-Fauvel can be as small as tiny prawns to the great octopus which possess 1-metre long tenticles. 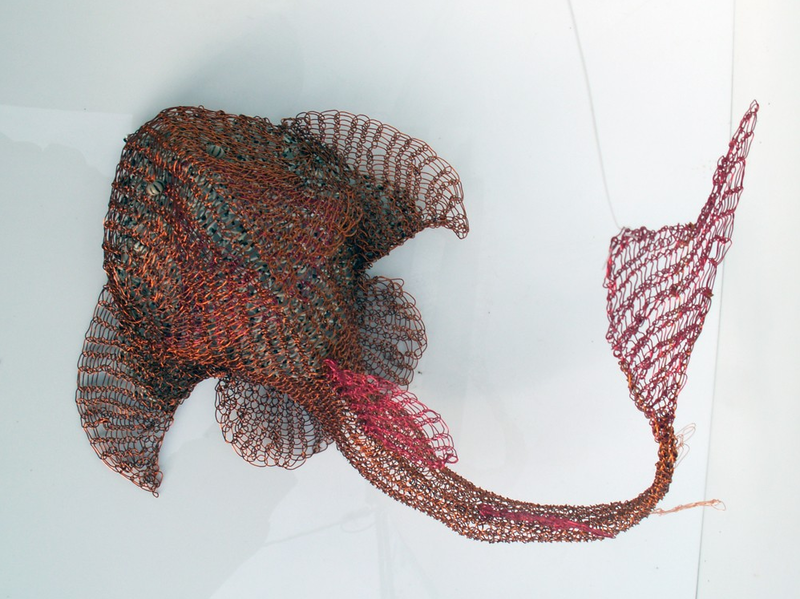 Bivet-Fauvel uses his knowledge of sea creatures to make woven bags inspired from mussels and clams. 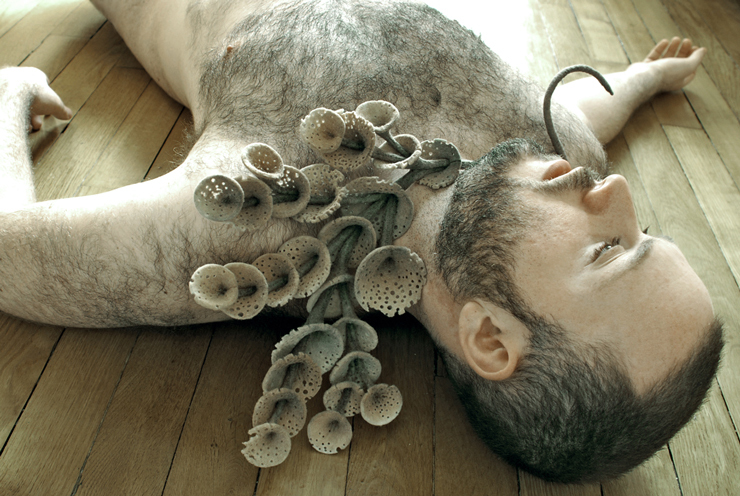 In addition he creates headgear, body pieces and creatures. Form observing works from other designers, I have understood more about how to create 3D forms, thus, hope to create some more experimental samples. 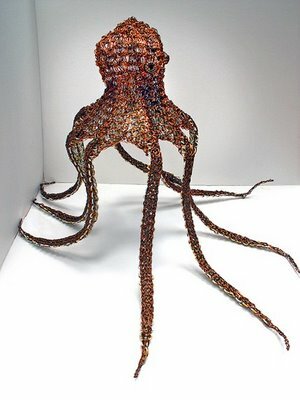 Perhaps begin knitting and crocheting to achieve different patterns and holes in the piece. Are You What You Wear/Buy/Sit/ On/Sleep In/Talk To? For this assignment we were asked to team up with a student from a different discipline who we did not know well and swap photos and contact details with one another. We were NOT allowed to discuss the photos with them. We then had to analyse them asking questions to ourselves like ‘What do they like? What are their favourite colours? Who are their influences? etc’. 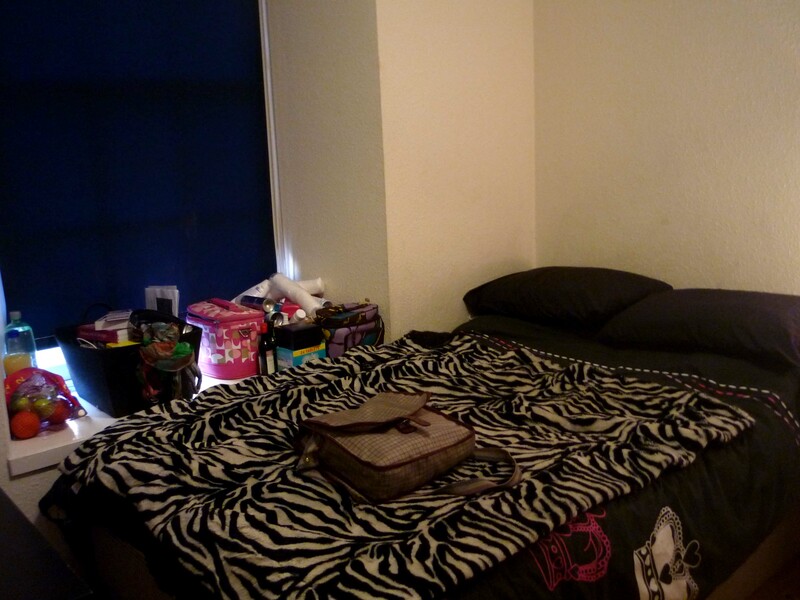 For my partner, I received three photos of her bedroom. 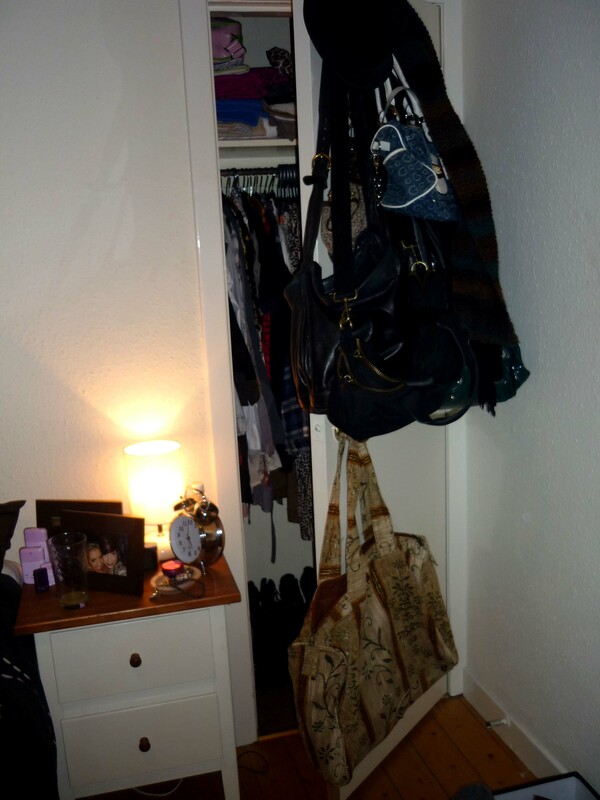 From looking at her pictures, I can say that perhaps she likes animal print (blanket), knitting and craft (needles on her desk and probably craft box beneath them), fashion (posters of fashion above her desk), handbags (hanging on the back of door), clothes, and tattoos (Ed Hardy book on top of her stack of books on her desk). This suggests she likes patterns, enjoys making things herself especially using fabric (and also supported by the fact she does textiles), likes to keep up with the latest trends and fashion (especially supported by the Gucci hand bags), and takes an interest in tattoo designs. There is a Cream book on her desk which probably implies she likes the band? There is an abundance of pink and black in her room, possibly colours she likes? Her influences could be from her friends as there is a picture of her and her friend, both looking alike. They look like they take pride in their appearance and takes care of themselves. She perhaps is significantly influenced by ‘what’s hot now’ (magazines, tv, fashion) due to the amount of fashion pictures above her desk. My partner looks like an extrovert, supported by the crown symbols on her duvet which emphasises the idea that she likes feeling like a princess? Thinks highly of herself? There is alcohol next to her window suggesting she likes going out, socialising and having fun and, in addition, there is fruit suggesting she likes to keep healthy and look after herself. She possesses a laptop, a variety of creams, hair products, alcohol, shoes, hand bags, clock, Ed Hardy book and a paisley print scarf, thus, looks like she is middle class. Everything looks new, well looked after, organised and tidy, backed up by the boxes and containers to keep everything sorted and neat and the calendar. Everything looks like a similar style but bought from different shops. My partner has customised her space by placing nic-nacs and objects in containers: organisation and tidiness is obviously crucial to her, the space is uncluttered possibly suggesting she feels stressed when surrounded by mess. Her room is well-lit, maybe due to the needle-work and her discipline, her space is also comfortable – a sign of high conscientiousness. After analysing the photos, we contacted each other and discussed our findings. I was pretty accurate apart from she did not like the colours pink and black and no she did not like the band ‘Cream’ at all. I got everything else right – how she takes pride in her appearance, she likes to look after herself, she loves tattoos, fashion and craft. Her analysis of me was pretty much spot on! She said I was well-travelled, influenced by my sister and brought back objects from all over the world. She has not revealed anything new about me, I already knew I love colour and pattern and that my home is comfortable. From this experiment, I learnt that my personality and home ambience can easily be conveyed simply through looking at pictures from my past. On the other hand, looking at my partners life, apart from feeling like an intruder, I felt very different to her. Different in personality, lifestyle and culture because in my room there are objects and trinkets from all over the world and in my partners room there were none. In the end, this saddens me because sometimes I wish I had just grown up in one place so that I would feel properly settled and feel like I properly fitted in. But in a different context, I feel fine that somebody has analysed my pictures because it would maybe give them an altered perception of life or they may just gain something from it. Who knows. There is a picture of her and her friend, they both look like they take pride in their appearance, take care of themselves. Looks like she keeps up with the present trends due to the amount of pictures above her desk and the Gucci hand bags hanging on her door. Looks like an extravert due to the crowns on her duvet maybe thinking she’s a princess? (sorry!) Also the picture on her bedside table she’s with her friend, looks like they’re at a party or club thus likes to socialise and have fun. What do they own? 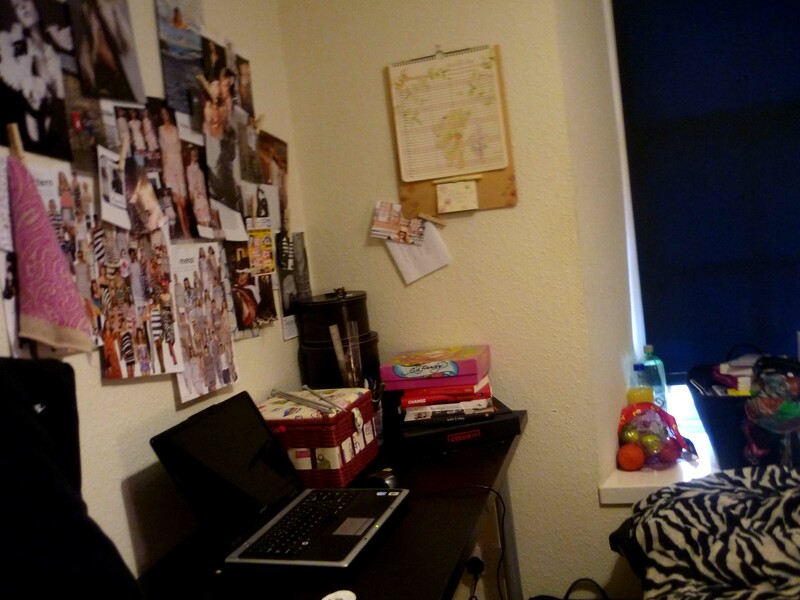 Laptop, creams, hair products, alcohol, shoes, hand bags, clock, Ed Hardy book, Cream book, paisley print scarf hanging on wall. Is everything new? Looks new, well looked after, organised, tidy. Is there a mix of styles or does everything look like it was bought at the same time or from the same shop? Everything looks the same but bought from different shops. How have they customised the space around them? Everything’s in containers, a calendar with a pencil under it, organisation and tidiness is obviously crucial to her, the space is uncluttered, well lit, comfortable and her books are organised a sign of high concientiousness. How have they made their own? Yes, I think she likes pattern.